Over the past three seasons, no two teams have lost as many games as the Philadelphia 76ers and Los Angeles Lakers. Positioned squarely at the bottom of a pit dug by their own hubris, the two clubs were left with no choice but to show patience and incrementally claw their way out. The undertaking has been painful, with competitive play taking a necessary backseat to the protracted and painstaking acquisition of assets and the development of young, homegrown talent. Now, having crawled their way through the feces-filled sewer pipe that is an NBA rebuild like a basketball Andy Dufresne, both teams now find themselves set up nicely for the future and ready to turn the corner. much like the joint a couple Lakers fans in my section very openly smoked at halftime, the entire scene was lit. 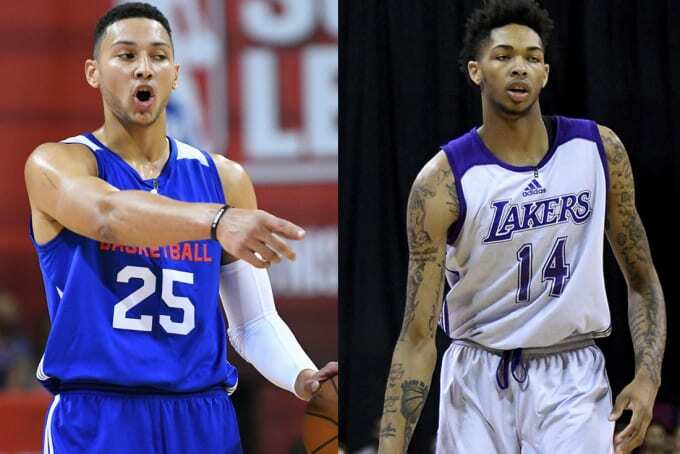 Last week, the NBA held its annual Summer League tournament in Las Vegas. Twenty-three teams were in town with assembled rosters of recent draftees, priority free agents, and hapless journeymen hopeful to find a stable landing spot. For the Sixers and Lakers, it served as a chance to unwrap two of the shiniest gifts produced by their rebuilds thus far—the first-and second-overall picks in the 2016 Draft, Ben Simmons and Brandon Ingram. As has become custom at Summer League, the two teams who selected at the top of the draft were tapped for a Saturday evening nationally televised matchup on ESPN during the opening weekend of the event. Playing just off the Las Vegas Strip at the Thomas & Mack Center—an arena that seats just shy of 20,000—the two teams nearly filled the place, with a final tally of 16,208 attendees crushing last year’s Summer League record of 12,422. Beyond its sheer size, the crowd was as raucous as any I can remember in the three straight years I’ve attended NBA Summer League. With Los Angeles just a four-hour drive away and Las Vegas a hotbed for adopted purple and gold supporters, the crowd was overwhelmingly made up of Lakers fans and Kobe stans. Larry Nance Jr. received MVP chants, Ben Simmons was jeered with each open jumper he inevitably passed on shooting, and much like the joint a couple Lakers fans in my section very openly smoked at halftime, the entire scene was lit. Most of the L.A. fans I encountered fit the general Lakers fan stereotype you probably already have in your head. They were unrealistically optimistic about the course of their rebuild, believing that most of the hard work had already been done, that the seeds of success had been planted, and now they merely had to wait for them to sprout and flourish. Some believed that the team’s young core of Brandon Ingram, D’Angelo Russell, Jordan Clarkson, and Julius Randle might push them into playoff contention this season. Their optimism is somewhat understandable. The Lakers have won more games than any franchise in NBA history. Their 16 championships are second only to the Boston Celtics, who have 17. And in their 68-year history, they’ve posted losing records in consecutive seasons just four times. Fans in L.A. have been spoiled by success. Philadelphia, on the other hand, is a bit more familiar with prolonged stretches of futility. 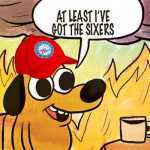 While the Sixers rank third in league history in total wins and are one of a dozen franchises with multiple NBA titles to their name, they’ve enjoyed a winning season just once since 2005. But the Sixers’ prolonged bout with basketball impotence has caused even some of the team&apos;s older fans to get on board with the 76ers&apos; aggressive approach to team-building. In the minds of those who support the rebuilding efforts, they’d rather fail while shooting for the moon than wither due to inactivity. This is certainly the case for 56-year-old Alan, a self-described “Process truster” from Harrisburg, Penn. Philadelphia fans were more sparsely spread throughout the crowd, but a shocking number actually made the trip. Alan came to Las Vegas with his brother Scott, a Bulls fan, and when I saw him sitting a few sections over wearing a t-shirt featuring former 76ers general manager Sam Hinkie’s face in the style of the famous “Hope” posters used by Barack Obama in 2008, I knew I had to talk to him. The pre-game hype was understandably all about Ingram and Simmons, but when the lights came on, it was another player who stole the show. D’Angelo Russell—the point guard selected by the Lakers second overall last season who famously played a part in the Nick Young/Iggy Azalea drama—dropped 22 points, including a game-winning three at the buzzer to give L.A. the 70-69 victory. After the game, Russell was interviewed by ESPN’s J.A. Adande, and in addition to loudly and unapologetically cursing within the first five seconds of the interview, he uttered a phrase familiar to Sixers fans: “Trust the process." Russell meant it as a way of describing his turnaround from a rough first half to a dominant second half, but it’s also sound big picture advice for Lakers fans, especially those who’ve never experienced the Lakers be anything but dominant. When I chuckled at his use of “Trust The Process,” a credo adopted by Sixers fans early in their rebuild and popularized by Spike Eskin and Mike Levin of the Rights To Ricky Sanchez Podcast, he interrupted me. what Simmons and Ingram lacked in consistency, they made up for with jaw-dropping flashes of their massive potential. The truth of the matter is that even when your team has made all the right choices in the draft, spent their money wisely in free agency, and even uncovered a handful the hidden gems off waiver wire, rebuilding in the NBA takes time. 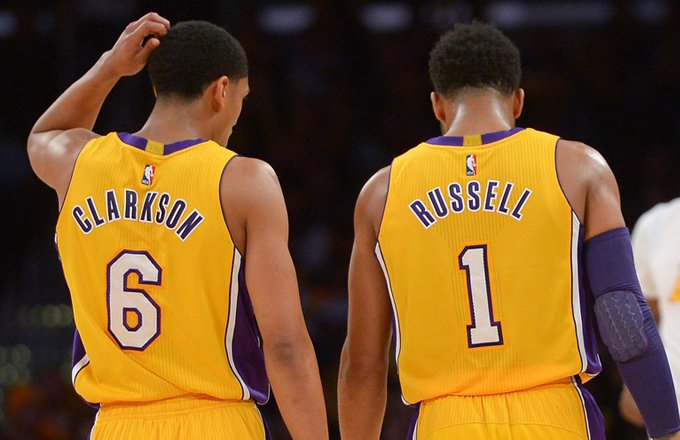 If the Sixers and Lakers are lucky, they’ll post win totals in the high 20s this coming season. Which, considering the league’s 82-game season structure, isn’t great. And even if Simmons and Ingram evolve into the superstars their teams hope they will one day be, it likely won’t happen for at least a few more seasons. At Summer League, the two rookies showed glimpses of their outstanding potential, but largely their play was up and down. Simmons earned First Team All-Summer League honors after averaging an impressive 12.3 points, 7.8 rebounds, and 5.5 assists in four games, but the 20-year-old Aussie also only shot 40.9 percent from the floor and averaged nearly four turnovers per game. Brandon Ingram similarly dazzled while struggling in terms of efficiency, averaging 12.2 points and 4.2 rebounds while shooting 41.2 percent from the floor and just 25.0 percent from beyond the arc in five appearances. But what Simmons and Ingram lacked in consistency, they made up for with jaw-dropping flashes of their massive potential. At 6’10” and 240 pounds, Simmons was able to physically overpower many of the small forwards matched up against him defensively. When power forwards tried to check him, he blew by them with his lightning-quick first step. And then, of course, there was Simmons’ passing. For Ingram, his length, quickness, and smooth shooting stroke were enough to excite Lakers fans. While the Lakers had Russell’s outstanding play at Summer League to supplement the performance of Ingram, the Sixers’ best player in Vegas other than Simmons spent his week wearing custom AC Milan jerseys and rubbing elbows with the Spike Lee of the Summer League Sixers, Meek Mill. Joel Embiid is still recovering from his second straight season-ending foot surgery, but he’s healthier than he’s been at any point since the team selected him third-overall in 2014, at the point where he’s playing full contact five-on-five in practice, and is putting together impressive clips of his abilities. His mere presence in the gym was difficult to ignore. Said to have grown about two inches (7’0” to 7’2”) since he was measured as a freshman at Kansas, Embiid is a physical and athletic specimen. Talk to anyone—scouts, media members, fans—about Ben Simmons and the Sixers, and the conversation eventually drifts to the broad-shouldered elephant in the room. Ben Simmons, many of them say, could change the Sixers’ lot. Joel Embiid, some allow themselves to dream, could change the league. Add to that the addition of former lottery pick Dario Saric, who joined the Sixers this week after two years playing in the Turkish Basketball League, and it’s easy to see why people are speaking so optimistically about a team that won just 10 games last season. In the immediate, the Sixers and Lakers remain cellar dwellers in a league where the talent disparity between the “haves” and the “have nots” is perhaps larger than it’s ever been (shoutout Kevin Durant). But with a little patience and continued trust in a painful yet necessary process, both have positioned themselves to potentially rejoin the league’s elites in the not-too-distant future.